Fried morel mushrooms are a rare treat, because morel mushrooms, if hunted locally, are often difficult to find. Fortunately, they are available for purchase in stores as well! I have been asked several times in the last few weeks if I have a secret recipe for cooking morel mushrooms (not just you, Eric :). I honestly don’t. The basics of cleaning them is something I can do, and I have fried other mushroom varieties, but I have never personally cooked a morel myself. I have eaten several, the best being made by the mother of a high school boyfriend. Hers were wonderful and if I still remember them 17 years later, then that is something special. Morel mushroomss, the edible wild mushroom, are prized for their smoky, nutty flavor. They will need a thorough washing since they are riddled with nooks and crannies. The wild variety is usually available from April through June. 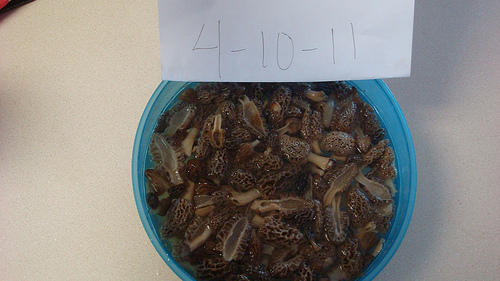 Cultivated morels, on the other hand are available all year round. 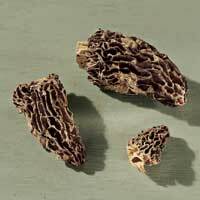 Dried morels are also readily available, but come at a high price. Dried morels make a very yummy wild mushroom risotto. ???? Choose fresh morels, with a firm yet spongy texture. In general, the darker the mushroom, the stronger the flavor. Remember, this is just my opinion. I think there are as many mushroom theories floating around as their are small towns in southern Indiana! Store fresh mushrooms so that cool air can circulate around them. Place on a tray in a single layer, covered with a damp paper towel and refrigerate for three days. Enjoy this basic fried morel mushrooms recipe! Melt butter in skillet on a low to medium heat. Coat morels in flour by shaking in a ziploc bag. Saute mushrooms (gently) in butter. **Note: This is just one of MANY ways to cook this fine fungus. Please don’t fill my inbox with complaints….Seriously. I have already heard that my 1 example is not the true way to cook them. Everyone has different tastes. I have also used rice flour, which I like better, but experiment with it and see what works for you. I know you can buy morels at Bloomingfoods in Bloomington, Indiana right now. They are pretty expensive, though. I love mushroom hunting!! Thanks for linking up to 2 Maids a Baking! !